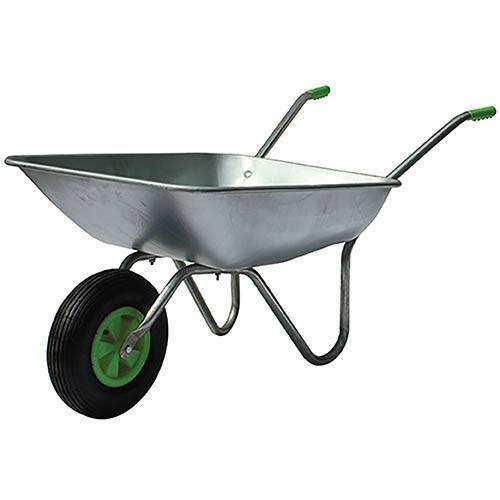 The Handy 65L Wheel Barrow is a traditional style wheelbarrow that is both strong and durable. Ideal for transporting materials and goods around the garden, it has a tough frame and a capacity of 65 litres. The pneumatic wheel and easy-grip handles make the wheelbarrow easy to manoeuvre and comfortable to use and it also means that it is easy to handle over both hard and soft surfaces. The galvanised pan is made to last for years and because of its construction the wheelbarrow is able to withstand harsh weather. It comes flat packed and requires a small amount of self-assembly.